Few filmmakers have career codas more disheartening than Claude Autant-Lara. Though dismissed by members of the French New Wave as part of the artistically sterile “tradition of quality” that supposedly plagued the French film industry in its first few decades of sound, Autant-Lara was one of the country’s most prominent and beloved directors throughout the 1940s and 1950s, releasing a string of crowd-pleasing, award-winning hits. Such was his popularity that even his original Cahiers du cinémadetractors came to begrudgingly concede his talents: François Truffaut declared admiration for his 1956 comedy La Traversée de Paris and Godard listed A Woman in White as the third best film of 1965, beating out movies by his beloved John Ford and Samuel Fuller. Yet his significant oeuvre is overshadowed by his 1989 election into the European Parliament as part of Jean-Marie Le Pen’s fundamentalist National Front. During his brief tenure, this once great artist who toiled under Nazi Occupation and witnessed their atrocities first hand gave interviews denying the Holocaust and attacking survivors—notably prominent politician Simone Veil—as liars and perpetuators of “ethnic politics.” His reputation was ruined, his place in the cinematic pantheon shattered. When he died in 2000, his work seemed consigned to oblivion. But whatever his latter day politics, Autant-Lara’s influence on cinema is undeniable and his work is vital to a complete understanding of pre-Nouvelle Vague France. 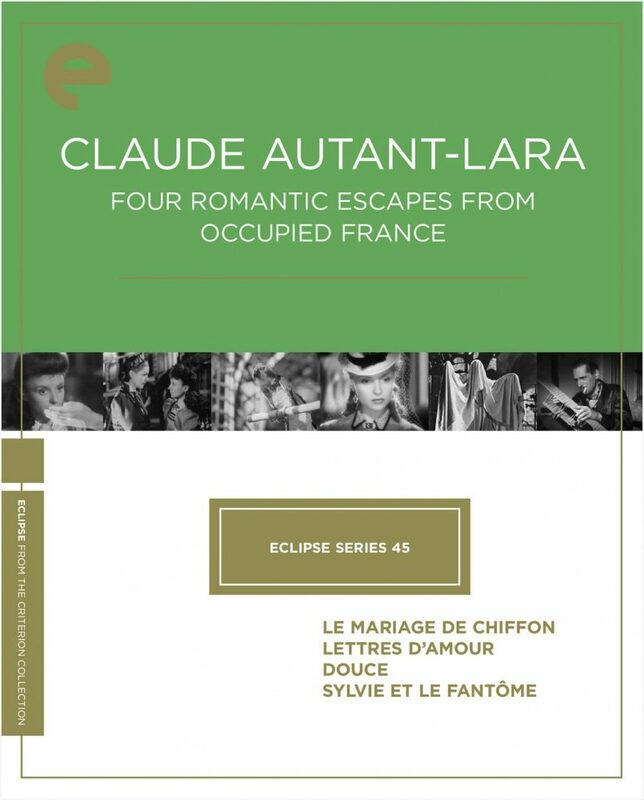 Thankfully, the Criterion Collection’s recent release of Claude Autant-Lara: Four Romantic Escapes from Occupied France as the forty-fifth entry in their Eclipse series is a welcomed introduction to his work for the uninitiated. Made either during or immediately after the German occupation of France in World War Two, these films are stunning time capsules of an industry under siege. 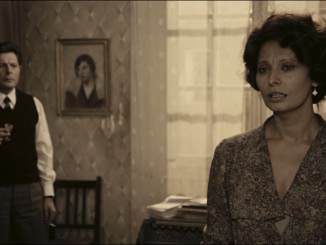 Largely made with the same stock company of cast and crew—especially the radiant former ballerina Odette Joyeux as the female lead in all four films—they are a testament to one of France’s most overlooked directors and his ability to create even under the most desperate of circumstances. With the ever-watchful eye of Nazi censors scrutinizing their every move, the French filmmakers unable to flee to America before the war found themselves forced to churn out inoffensive, apolitical pap, usually in the form of lavish costume dramas and fantasies. 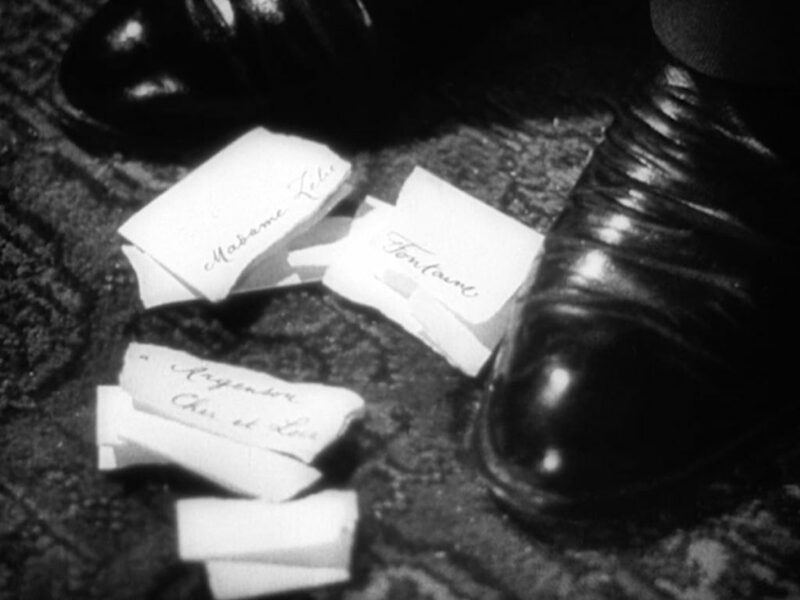 At first, Autant-Lara played along, as is evident in the first two films in this four film collection: Le mariage de Chiffon (1942)and Lettres d’Amour (1942). Both are anodyne historical romances that see Joyeux navigate her way through labyrinthine love triangles. In the first, Chiffon (Joyeux) finds herself trapped between an engagement with an elderly yet socially prominent military colonel, the Duke d’Aubières (André Luguet), and the love of her life, her penniless inventor/aviatoruncle-in-law Marc de Bray (Jacques Dumesnil). The second sees Joyeux play Zélie Fontaine, a twenty-year-old widow and postmistress of a small village who gets mistakenly accused of having an affair with the new magistrate after getting caught with his love letters intended for a local aristocrat. Both are light, fluffy affairs which counter-intuitively demonstrate more of Lubitsch’s famed Teutonic touch than the expected lineage of French bedroom farces. They exude an easy, gentle insouciance suggesting that while hearts might be in play, the whole ordeal is merely a game from which the losers can walk away with their dignity intact towards a cheerier tomorrow. Even the creeping class tensions in Lettres—best summarized in the constant bickering between the aristocratic “Society” and the proletariat “Shop”—cannot withstand Autant-Lara’s happy breeziness; indeed, the film ends not with a confrontation between the classes but with a lengthy Renoir-esque sequence where the villagers all learn the newest, hottest dance craze—the Quadrille! These films are inconsequential fantasies, but it’s curious to see how Autant-Lara uses them to rally French pride in a time of humiliating defeat. Both films begin with lengthy asides following supporting male characters puttering around before stepping aside to make way for Joyeux and the actual plots. These lull the audience into a soporific haze with memories of better times. Chiffon opens with d’Aubières returning home from a 10-year deployment and strolling through the rainy streets of his small town, coyishly flirting with shopkeepers with all the winsome noblesse oblige of a pre-World War One aristocrat. Lettres begins with an even longer segment that sees none other than the emperor Napoléon III (Jean Debucourt) arriving in Zélie’s tiny village where he walks through the grassy fields and chats with the local peasants. This is who we once were, Autant-Lara seems to be insisting. Proud yet not haughty, dignified yet not snobby, unbeaten yet gracious to all peoples. And perhaps, he whispers, this is who we will be again. 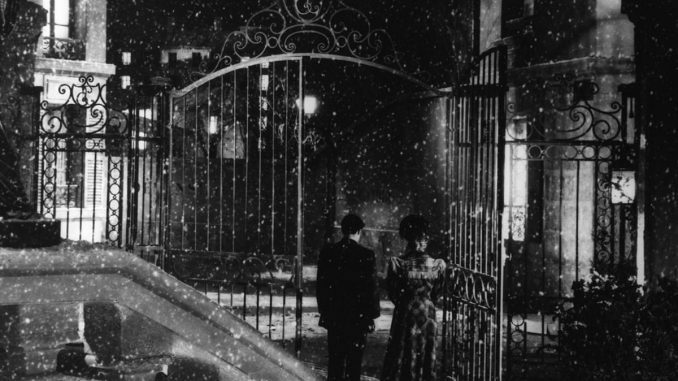 But make no mistake, both Le mariage de Chiffon and Lettres d’Amour are minor achievements, mere cinematic bubbles that pop as soon as the final credits role. 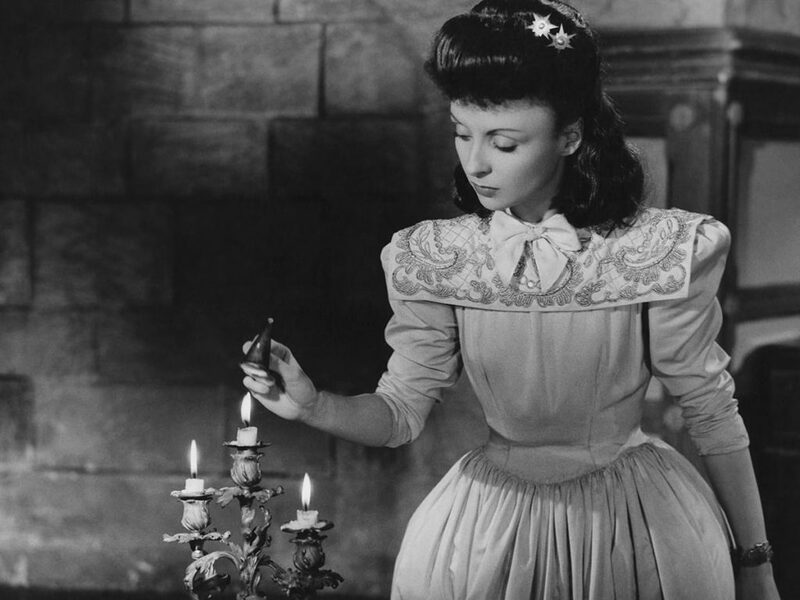 It is with the third film in the collection, Douce (1943), that we truly get a glimpse at Autant-Lara as a filmmaker in full control of his powers. The story of not just one, but two doomed romances, Douce shocks with its near nihilistic look at youthful romantic idiocy and aged romantic resignation. The film follows the misfortunes of a family of aristocrats living in turn-of-the-century Paris. The impetuous daughter Douce (Joyeux) falls in desperate love with the estate manager Fabien (Debucourt); such is her passion that when a priest warns her that her plans to run off with him are doomed to fall, she declares him her sworn enemy. Elsewhere in their drab mansion, Douce’s aging governess Irène(Madeleine Robinson) struggles with her affections for her mistress’ good-hearted father. Both know their love can never be—the class difference between them is too great—yet they still pine for each other during the long dreary nights. And through it all reigns their imperious, holier-than-thou materfamilias, the Countess de Bonafé (Marguerite Moreno), who runs the house and her descendents’ affairs with an iron fist and an upturned nose. Something must give. And in a truly shocking Diabolus ex Machina, one of the four fools in love dies in a theater fire, smashing the remnants of their once mighty family into pieces. By 1946, the war in Europe had been over for a year: Hitler and Mussolini had been defeated and Hirohito and the Japanese armed forces were on the ropes in the Pacific Theater. But the sting of occupation was still fresh in the minds of the French people. It was in this time of painful reconstruction that Autant-Lara released Sylvie et le fantôme, a triumphant romantic fantasy made with his team of wartime regulars that single-handedly justifies the full purchase of the entire Eclipse box set. Part fairy tale, part Georges Méliès special effects revue, the films sees Joyeux as Sylvie, a teenager on the cusp of womanhood whose father hires three men to masquerade as ghosts during her sixteenth birthday party. Or more specially, to masquerade as oneghost: the White Hunter, the lovesick spirit who has haunted the halls of their family’s ancestral château for nearly a century. But things go quickly awry when the real White Hunter—played by legendary silent comedian and director Jacques Tati in his first onscreen appearance—also comes a’courting. Whereas the lightness in Chiffon and Lettres felt blithe and forced, here it feels sincere and compassionate. Take the opening scene where Sylvie guides a group of children through the secret passages which the White Hunter once used to court her grandmother before dying in a duel. When they enter one dank and dark hallway, they bump into one of the young men hired by her father. When Sylvie asks his name, he smiles and answers “I hate my name, because you’ll soon hate it” and scurries off. It’s the kind of simple yet effective meet cute that no amount of mushy string music or soft focus cinematography could hope to match. This earnestness echoes throughout the rest of the film, turning potentially melodramatic dreck such as a hardened street gangster going soft over his sudden love for Sylvie ring true. Even when the film threatens to devolve into mindless Marx Brothers farce in the last act when all four “ghosts” haphazardly run amok among the party guests, it elevates itself to a point where we’re laughing with the equally confused suitors, not at them. And then there’s Tati—oh, how many actors and actresses could dream of such a perfect debut? Shot using a technique involving optical glass positioned between two identical sets, Tati was able to appear as a ghostly figure while physically interacting with the sets, the props, and occasionally even the “living” performers. Besides a similar urbane propriety and a penchant for silence, there’s little of Tati’s immortal cinematic persona Monsieur Hulot in the White Hunter: he has none of Hulot’s emotional detachment and distance. 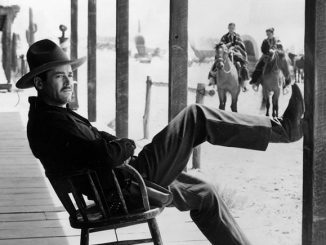 If Hulot inhabited an eternal yet immediate present, the Hunter is shaped and molded by the joys and sorrows of the past. Watch how he wistfully revisits the old château’s grounds; how he plays with his ghostly dog Pyramus; how he delights in slight acts of mischief; how he aches with feeling at the sight of Sylvie, a woman so much like the one he died for, a woman he can never have or hold or touch. And when he finally resigns himself to the heavens following his one night on earth with Sylvie, we realize that we are witnessing the figurative and literal ascendancy of one of the cinema’s most extraordinary stars. In the recent turmoil surrounding the Harvey Weinstein allegations and the #MeToo and #TimesUp movements, audiences have become rightfully suspicious of artists with imperfect pasts of reprehensible behavior and destructive politics. 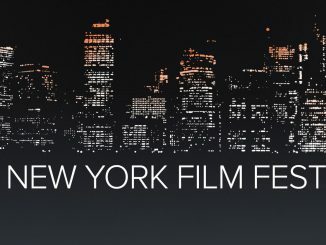 It’s easy to imagine that many viewers will be as unable to overlook the heart-breaking third act of Autant-Lara’s personal life as the accusations of child molestation against Woody Allen, domestic abuse and anti-Semitism against Mel Gibson, or sexual assault against Kevin Spacey. Holocaust denial is inexcusable, especially when welded by elected officials. The best we can hope for is that these four films were made before the sickness of racism and bigotry infected the mind of this once great artist. At the very least the man is no longer alive to profit off the sales and resurgent popularity of his work. These are small comforts. But perhaps they are enough to ease the minds of those hungry to discover these crucial pieces of French cinematic history.